New Glenavon signing, Paddy McCourt, pictured during his Derry City playing days. FORMER Celtic star, Paddy McCourt insists he would never rule out a return to Derry City despite his move to the Brandywell club falling through this week. Derry City boss, Kenny Shiels surprisingly opted not to purse a move for the playmaker’s signature, leaving the door open for Glenavon to pounce and complete a one-year deal to bring him to Mourneview Park last Tuesday. There’s nothing happened that would mean I wouldn’t go back - that’s not the case. I couldn’t say I would definitely go back either because you just don’t know what will happen in football. However, McCourt, who played with Derry between 2006 and 2008, claims he bears no ill feeling towards his hometown club and promised to be a regular attendee at home matches this season. 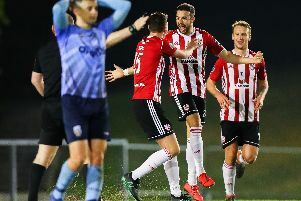 The 32 year-old Shantallow man’s admission that there may still be a chance of him playing once again in the red and whites stripes, will certainly be welcome news for Derry City supporters. But for now, he’s simply focused on the upcoming campaign with Glenavon. “It was out of my hands really,” McCourt said of the potential Derry City move. “I couldn’t do too much about it. That’s football at the end of the day. “I wish Derry nothing but the best of luck. I’ll be going back this year as a fan because the games are on a Friday night and I won’t be playing until a Saturday. So I’m looking forward to going over to watch the games and taking my son to the games. There’s no hard feelings on my part. I’ll still be supporting them as a fan like I always have done. Asked if he would ever consider a return should circumstances be different in the future, McCourt said he wouldn’t rule it out. “I don’t know,” he said. “You just have to wait and see, I’ll see how this year goes. If I enjoy it up in Glenavon this year I’ll probably end up wanting to stay there. The N. Ireland international says a move to the Irish League made sense given teams are currently in the middle of pre-season. And Glenavon boss, Gary Hamilton also played a pivotal role in bringing him to the Lurgan Blues, despite interest from clubs both north and south of the border. “The League of Ireland season finishes at the end of October, start of November and it wouldn’t have given me a chance to get up and running,” he explained. “Whereas the Irish League isn’t starting for another two or three weeks which gives me and extra bit of time to get to where I want to be and that was one of the key reasons behind my decision. Gary’s been trying to get me to sign from day one. He first contacted me about eight or nine weeks ago and he worked hard to get me in. A lot of the stuff he was saying really appealed to me. “And knowing I would have Ciaran (Martyn) there to travel with helped as well. So it’s just about looking forward to getting the season started now and hopefully I can hit the ground running. “Getting the first couple of sessions out of the way is the hardest and it’s about getting back into the run of things.